Orphans: Are they really good for anything? In short, NO Yes. Orphans give us the comfort that we aren't the only people in the world that no one loves. Katie: We should feed them to third world countries and feed them to the blind. Africans will be thankful, after eating the delicious orphan meat. Tender, crisp, juicy and very tasty. ORPHAN MEAT FOR ALL. Food Supply - if a lion at the local zoo gets hungry, we can toss in a few orphans. Like, who's going to miss them - their parents? Their meat has also been known to be perfect sustenance for meat dragons. Hallucinogenics - The tears of orphans are most often used as an illegal drug, which often causes feelings of undeserved self worth and hallucinations of a naked Spider-man. Is also the main ingredient in a widely known beer, which will make you think you are an orphan and that you can drink your own tears. Energy Source - Contrary to previous belief, orphans burn brighter than any known substance and possess an amount of energy surpassing that of lightning. In fact, only 362 orphans in a standard furnace would burn with the intensity of a thousand suns!!! Back breaking labor - I'm not gonna break my back if I've got an orphan or two handy. Fun and Games - orphans provide hours of enjoyment for people. Plus they make great left-fielders for the local softball team. Other sports involving orphans include Orphan Hunting, in which nets and tasers are used to subdue wild orphans, and Orphan Fighting in which two orphans are pit against each other for a piece of raw meat. Pets - Bathe them, dress them up in cute little outfits, feed them, train them to do tricks, take them for walks, and show them off to your friends. Toddler and baby orphans are recommended most for this purpose. Money Pits - Americans are constantly trying to find some lost cause at which to throw money: orphans are the perfect waste of money. There are so many orphans that our children's children can waste their money. Plus, no amount of money can bring their parents back! Unless of course you take the money and make a "life-giver-back machine". But then that's not giving money to orphans, now is it? Arts and Crafts - Orphans can be used in the chair-making industry. To make a chair, one simply has to staple two orphans together and dip them in molten plastic. Egg chairs are made in a similar fashion. Orphan hair is widely known to make excellent rug material. Finally, plaster-dipped orphans make excellent statues. 1 Orphans: Are they really good for anything? The housing costs associated with orphans can really restrict your available funds! Food Supply - orphans make great food for animals, but to keep them alive we need to feed them and that drains our (the real people's) food supply. Energy Drain - orphans don't enjoy living in cardboard boxes in the street and require homes in which to live. These homes, or Orphanages, require an ungodly amount of energy to operate. Money Pits - The money spent on these orphans could be better utilized elsewhere. It is argued that orphans are an eye sore, as in they are unpleasant to look at, especially if they are wearing rags, have no shoes and have a muddy face. It is well known that orphans are the cause of 2/3 of all child related deaths. When the moon is half empty, the orphan will transform into a deadly monster. Mythological stories involving violent gorilla's (such as King Kong) are believed to be tales about dangerous orphans. 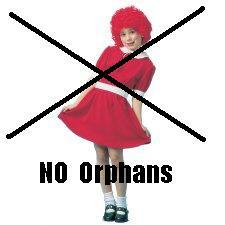 The rumor that an orphan's bite will turn you into one has recently been disproved, but if you survive an orphan attack it probably means that it was full and your whole family is dead... making you an orphan. One of those age old stories is whether or not an orphan would be able to defeat a baby seal. Dr. Steve Kranich was very close to a breakthrough, before his torso was devoured by a particularly hungry orphan. Communist Russia attempted to crossbreed orphans and baby seals, but the project was abandoned after three dozen casualties. An experiment was conducted by N.A.S.A ( Not American Space Association) to send orphans and baby seals to the moon in order to finally see which one would be victorious. They are still waiting on the results.There was another experiment were they cut the heads of orphans and feed them to baby seals, hoping to make a super seal in which could eradicate all orphans.it was finally put to rest that seals are better when Seal Team 6 killed Osama Bin Laden. how many orphans have killed Osama Bin Laden, that's right NONE! When left alone, or placed in a confined space, orphans are known to produce heat, this heat then allows them to survive without food indefinitely through a completely logical sequence of logical logic. Chip friers, radiators, steam engines and incubators are all known to use this form of energy. However another key feature of orphans is their pungent smell, one of the world's largest causes of greenhouse gases, making this source of energy extremely dangerous. Ironically, this is also money spent on orphans. The lovely Admins who keep Uncyclopedia so great! Lower taxes and costs for us real people. Me - cash only please! You see the orphans' pro's outweigh the cons, but the better uses for the money trump all so we should get rid of orphans! BUT MOST ARE! Here is a list of orphans that have changed the world (or at least the US and parts of Europe)BUT most are dead, and the rest are Orphans so....Who cares? John Frazier the President of Mexican Foreign Relations in the year 12 B.C. Leela Mutant without depth perception. Your complete shopping adoption satisfaction is our number one priority. If an item, dog, midget, orphan you've ordered does not meet your expectations, simply return it either to a store or by mail within 90 days of receiving it, unless otherwise noted below. The fee to adopt an orphan is $10. If you adopt two orphans in one visit, the first orphan's adoption fee is $10 and the second one's adoption fee is only $7. If you adoption three pets orphans during one visit, the first orphan's adoption fee is $10, the second one's adoption fee is only $7, and the third one's adoption fee is only $5.99. Non-traditional orphans (such as black people, Jews, chimpanzees, guinea pigs, Communists etc.) are available at various adoption fees. Please call the Center at 236-786-77426 (adopt-orphan) for more information about our non-traditional adoption fees. All orphans are spayed or neutered by our staff veterinarian PRIOR to leaving the orphanage. There are NO exceptions. Please note: We do not ship or arrange transportation for adopted pets.